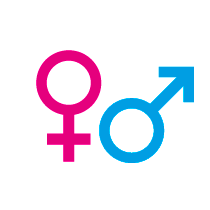 The two well-known gender symbols describing the male and female have been involved since renesansens days and was first used to symbolize the gender of the different plants. The gender symbols have their origin in astrology and represents the classical planets Mars and Venus. The upward arrow represents the male and the downturned cross the female. 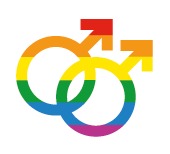 Double interlocking male or female symbols also exist and have been used by homosexuals since the 1970s. A common use for gender symbols in the present day is the separation of men and women's toilet in a restaurant or other public facilities. Usually with a creative touch and variety.